It's no secret that SPF is necessary to protect skin year-round, but on sunny summer days when the UV index soars the need is even greater. What's more, most people only apply enough sunscreen to achieve 60% of the protection promised on the bottle. One way to amp up your SPF? 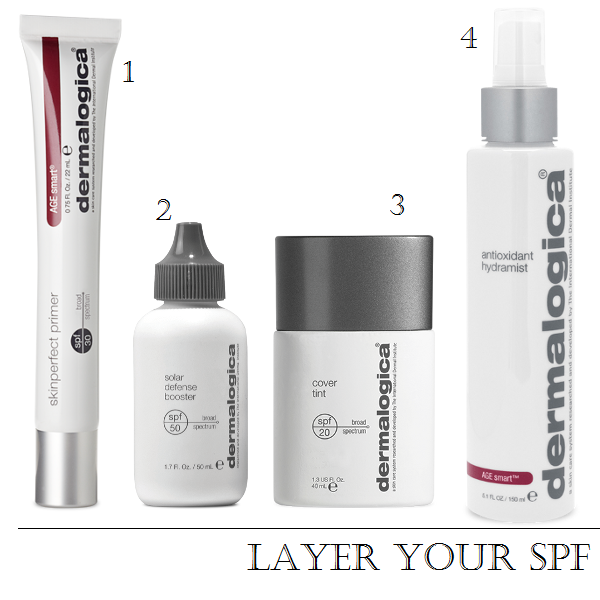 Layer on sun protection gradually by swapping your regular moisturizer, primer, and makeup for versions with SPF. You can use this trick with most SPF-infused products, really, but Dermalogica makes some pretty nifty ones. As I experienced firsthand at their spring preview, these broad spectrum products have light, non-greasy textures that don't feel heavy and sticky when worn one on top of the other. So mix, match, and layer away—your skin will thank you! 1. Prime skin with the luminizing SkinPerfect Primer SPF 30 ($67, previously reviewed here). 2. Skin Defense Booster SPF 50 ($67) can be mixed with your favourite moisturizer or foundation, or worn alone. 3. Cover Tint SPF 20 ($67) evens skin tone and tops up sun protection as the final layer. 4. Throughout the day, spritz on Antioxidant Hydramist ($54), which contains peptides, vitamins E and C, and glucosamine to fight skin-damaging free radicals. I love Dermalogica products and have purchased their Pre-cleanse for years. With my last Pre-Cleanse purchase, I got a gift with purchase which was their vitamin serum and the Antioxidant Hydramist. I didn't really like the serum (felt silicon-y), but I loved the hydramist and purchased the full size. I can't tell you how lovely the mist smells .. d i v i n e !